The highlight of the YotaPhone 2 is its rear e-Ink display and its services. It has three primary functions - Yota Cover, Yota Panel and Yota Mirror. Switching between Cover and Panel is very easy, just touch the on-screen key at the bottom. Yota Cover is basically an always-on wallpaper with four dock shortcuts - phone, messages, email, and notifications. You can set different wallpapers for the Yota Cover - choose from Facebook, Instagram, the pre-loaded collection or Yota's cloud collection available for download for free. Whatever you choose, it sticks on the back of the phone like a default print from the manufacturer. This is one of the things we really like about the YotaPhone - you can change the phone's look wherever you want. Yota Panel is a collection of widgets you can put on various homescreen panes. There is a plethora of available widgets - the time, the weather, favorite contacts, the default docked shortcuts, the e-book reader, YotaBattery saver, Play Books, Yota Games, music player shortcuts, among others. In addition to those different widgets, you can choose between various layouts for them. You can use the dialpad on the e-paper screen, you scroll through the recent calls, but we weren't able to access the full-blown phonebook. You can also read messages and emails, as well as view the number of new notifications. To see all the notifications available you'll have to switch to the main screen though. The YotaPhone 2 comes with few e-paper-compatible games preloaded - Chess, Checkers, Sudoku and 2048. They work only on the rear screen no matter where you launch them from. In addition to those games, you also get the mandatory eBook reader called Yota Reader, where you can upload and read e-books. There is also a YotaRSS app to read your favorite feeds from the web. The latter requires a Feedly account. Reading an e-book is a real pleasure on that e-paper screen and while its contrast and sharpness isn't as good as dedicated e-Readers such as Kobo or Kindle (probably because the protective curved glass), there is still no smartphone to offer better experience with e-books. 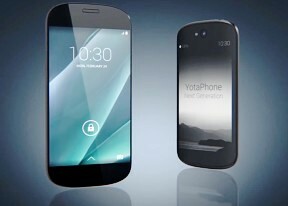 Yota Mirror is activated with an upward swipe from the bottom of the screen, next to Google Now shortcut. It switcher off the AMOLED screen and transfers the UI on the e-paper display. You can use the entire Android functionality this way, including the camera viewfinder (hello, selfies!) although the display isn't meant to handle a colored OS and it doesn't look pretty. Still, if you want to run Android on the rear screen - you can do it. Yota Energy Saver isn't a feature exclusive to the rear display although there is a dedicated widget for turning it on/off and it calculates the estimated available battery time. You can activate the Yota Energy Saver from the Quick Toggles, Settings menu or the e-paper dedicated widget. You can configure the Yota Energy Saver and its behavior from Settings. The e-paper display has capacitive touch sensors, but it does look laggy due to the inherent nature of the e-Ink technology. It requires time to display an image on the display and every few pages a refresh is done to clean the screen from the ghosting effect.